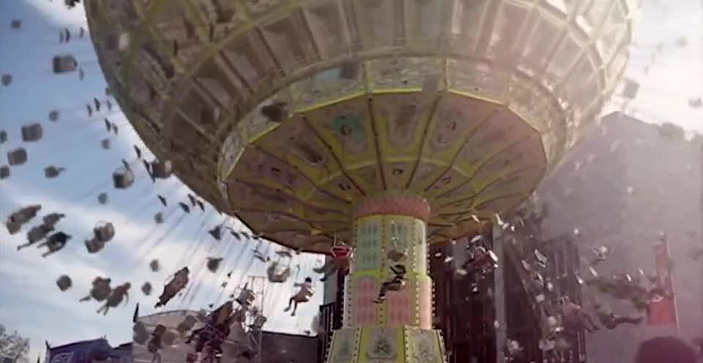 "A documentary on extreme amusement park rides and their effects on the brain." German artist Till Nowak, founder of Framebox studio and disciple of Chaplin’s subversive humor takes a look at the follies of modern society in this documentary short that portrays “caricatures of civilization”, amusement rides that people willingly take in order to be centrifuged. Coming from a digital arts background with a number of previous works made in 3D animation and others combining 3D with filmed footage, Till has taken the live filmmaking route while still making great use of CG to potentiate the story. Humor permeates this purported scientific documentary, which is presented in the most deadpan, poker-faced way. The documentary’s style follows what is usually called the “expository mode”, the type of documentary that aims to inform viewers using interviews and various kinds of evidence to support its argument. In this case, however, the information passed on to the viewers is complete nonsense. But it’s delivered in the most realistic way, complemented with footage that “proves” that the rides exist. 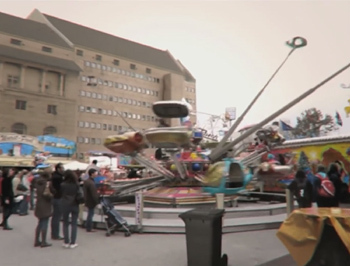 Till Nowak’s intention was to make the film look realistic, but not to make people actually believe that the amusement rides existed. He was quite surprised to find out many people believed the film was real. Still, this was the case, and it shows that he was very successful at building a convincing façade. In this analysis we’ll focus on the film techniques he used to build and maintain this façade. 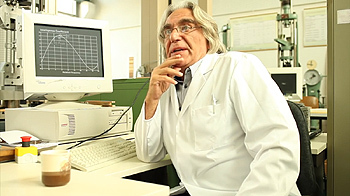 The Centrifuge Brain Project uses many medium and close-up shots, which are used to frame Dr. Nick Laslowicz’ interview. These are usually stable and filmed with a tripod. The subject is filmed from an angle, not frontally, which is standard practice in documentary filmmaking and projects a degree of emotional detachment. Wide shots are employed during park rides to cover the action. Camera height is usually at eye level or that of a human and seldom leaves the ground. Rides are shot from below, from the position of an observer. Here we find one of the elements that is used to transmit a feeling of authenticity: handheld camera moves are used most explicitly in the amusement ride sequences, with the aim of showing that the footage was shot on site by an amateur. These contrast with the smoother camera moves during Dr. Laslowicz’ interview, in which the camera is mostly static with some occasional slow-paced pans. When Dr. Laslowicz is not seating a handheld camera is used to follow his actions, but it’s far more restrained than the shots of the rides (this is usually the case also when the subject is walking around amusement parks).